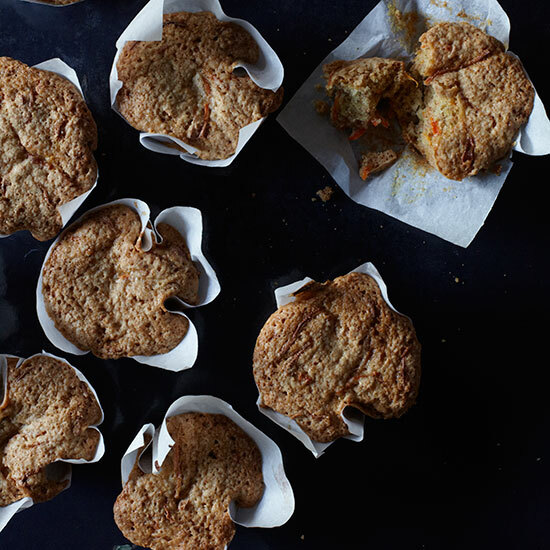 Preheat the oven to 350° and line 18 muffin cups with paper or foil liners. In a medium bowl, whisk the flour with the baking powder, baking soda and salt. In a large bowl, whisk the sugar with the oil and eggs. Whisk in the dry ingredients until just incorporated, then stir in the wheat bran and carrots. Spoon the batter into the prepared muffin cups and bake for 18 to 20 minutes, until a toothpick inserted in the center of a muffin comes out with a few moist crumbs attached. Let the muffins cool for 10 minutes in the pan, then turn them out onto a rack to cool completely before serving. The muffins can be wrapped in plastic and stored at room temperature overnight.